Given the sprawling dimensions to one of sport’s greatest theaters, THE PLAYERS Stadium Course at TPC Sawgrass, there’s ample opportunity for drama. Such is the nature of golf, however, that sometimes the drama unfolds unexpectedly and with gut-wrenching emotion. That was the case at THE PLAYERS Championship 2011 when even the winner, K.J. 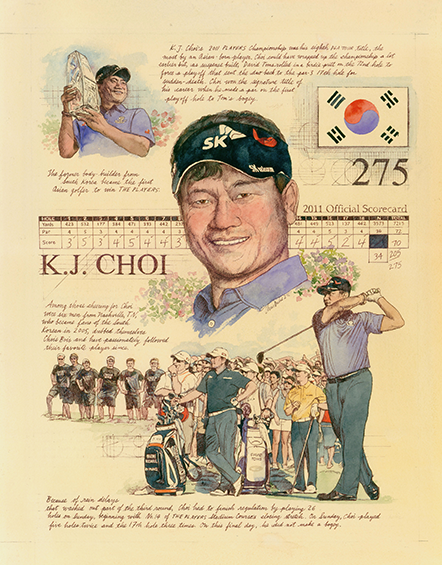 Choi, reacted immediately not to his joy but to David Toms’ heartache. “As a fellow player, I felt very sorry for him,” Choi said after Toms’ missed a 3 ½-foot putt to bogey the first playoff hole and lose. Compounding the drama was the fact that just 15 minutes earlier, Toms had made a thrilling birdie at the 72nd hole to tie Choi at 13-under 275. Wild, the swing of emotions in front of fans who rode the roller-coaster on a long day that started with the completion of the third round and continued with a wild fourth round. Toms did not have a monopoly on the disappointment, because Graeme McDowell started the fourth round with a one-stroke lead, only to close with 79 and kick the door open for Choi and Toms. Choi, 40, and Toms, 44, each shot 2-under 70, but the closing swings of momentum were memorable — a bogey for Toms at 16, a birdie for Choi at 17, a birdie for Toms at 18. The three-putt bogey by Toms at the island-green 17th in the playoff provided the clinching drama. It’s a fixture at such a brilliant arena.